Hello, and welcome to this new blog. I am Chris Austin, I work independently on high energy physics theory, in Maryport on the north-west coast of England. With regard to the title of the blog, may I first apologize to Lewis Carroll for the take-off. I am working on models of high energy physics in which the known elementary particles, which comprise 6 types of quark triplet, plus the electron and 2 similar heavier particles, plus 3 types of neutrino, plus the photon and 11 roughly similar particles that transmit forces, plus a Higgs boson candidate, plus the graviton, arise from supergravity in 11 dimensions, otherwise known as -theory, when the 7 extra dimensions of space are curled up into a suitable small shape. The 7 extra dimensions of space are too small to have been seen up to now, but could become visible for the first time at the Large Hadron Collider, which started operation at CERN, in the region of the French/Swiss border near Geneva, in 2009. While working on these problems, I often feel as though I am crawling on hands and knees through an unfamiliar but wonderful place. -theory and superstring theory have taken a few knocks in recent years, and over the course of some posts here, I'll try to say a few words for the defence, while possibly also filling in a bit of the background. I hope this blog will be fun and useful for everyone with an interest in science, so although I'll pop up a few formulae, I'll try to make them friendly by explaining all the pieces. Please feel free to ask a question in the Comments, if you think anything in the post is unclear. Today I would like to tell you about the foundation of our understanding of high energy physics, which is Richard Feynman's functional integral, but first I have to tell you about action. The post got a bit long, so I have divided it into ten parts. The following parts, which will appear at intervals of about a month, are Multiple Molecules, Electromagnetism, Action for Fields, Radiation in an Oven, Matrix Multiplication, The Functional Integral, Gauge Invariance, Photons, and Interactions. About 60 years after Sir Isaac Newton published his laws of motion in 1687, Pierre-Louis Moreau de Maupertuis discovered that Newton's laws follow from the requirement that a quantity he called "action", that depends on the positions and motions of a collection of objects over a period of time, should be relatively unaltered by small changes in the positions and motions of those objects. For an example, let's consider a collection of objects, such that each object behaves approximately as though its mass is concentrated at a single point, the objects are moving slowly compared to the speed of light, and the forces between the objects arise from a contribution to their total energy, called their potential energy , that depends on their positions but not on their motions. This is a useful first approximation for many things in the everyday world, for the Sun and the planets in the Solar System, for the motions of most of the stars in our galaxy, and for the atoms in a solid, liquid, gas, or living thing. Here is the action. 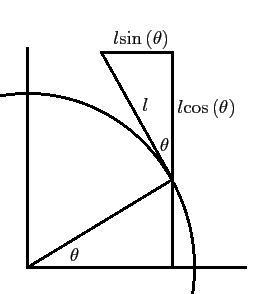 The symbol was once an alternative form of the letter , and is nowadays called the integral sign. It means a sum of what follows it. The upright letter in means ``a tiny amount of,'' and was introduced in this context by Gottfried Wilhelm Leibniz. The idea is that the period from to is divided up into a great number of tiny time intervals, each so small that and only change by a tiny amount during any one time interval. The notation means that is the sum of a contribution from each of these tiny time intervals, and the contribution from a tiny time interval of length is the product of and the tiny amount of time , where and are evaluated at an arbitrary moment during that interval. Then for motions such that and vary smoothly with time, the sum of all the contributions changes by an ever smaller amount as the period from to is divided up ever more finely, and is the limit of the sum of all the contributions, as the period is divided up so finely that the length of the longest tiny interval tends to 0. We can specify the position of an object at a particular moment in time by 3 numbers, called coordinates. For example, we can specify the position of an aeroplane by its latitude and longitude, in degrees, and its altitude, in meters. We can write these 3 numbers as a list, for example (latitude, longitude, altitude). If the number of objects in our example is , then their positions, at a particular moment in time, can be specified by a table of numbers with 3 columns and rows. Each row gives the coordinates of a different one of the objects. The motions of the objects over a period of time can be represented as accurately as desired by a series of such tables, one for each of a closely spaced sequence of moments in time. It is convenient to let a single symbol, say , represent this entire collection of data. Then if the letter , for example, represents one of the numbers 1, 2, 3, and the letter , for example, represents one of the numbers , the value of position coordinate number , of object number , at time , can be represented as , where the subscripts , , and are called indexes. Alternative notations for the same thing, which can be used as convenient, are , and , for example. The speed of an object is proportional to the rate at which its coordinates change with time. If a collection of data that gives the value of a quantity at each moment in time is represented by a symbol or expression , then the collection of data that gives the rate of change of that quantity with time, at each moment in time, is often represented as , or alternatively . The Leibniz in the numerator of means, ``the change in the following expression, when the time changes by the tiny amount ,'' and indicates that the formula is to be taken in the limit where the size of the time interval tends to 0. The value of at time is , which is well-defined if changes smoothly with . The coordinates of the objects in our example will change smoothly with for a sensible choice of position coordinates, since we assumed that is small compared to the speed of light, and thus finite. To calculate the speed of object number , we need to know to the distance travelled for a small change in its coordinates . For example the distance travelled by an aeroplane, for a change in its longitude at fixed latitude and altitude, is smaller, the closer the aeroplane is to the north or south pole. For the flat 2-dimensional world of Euclidean geometry, we can choose as coordinates the distances from 2 fixed straight lines, at right-angles to one another. These coordinates were introduced by René Descartes, and are called Cartesian coordinates. The distance between two points whose coordinates differ by and whose coordinates differ by is then given by Pythagoras as , since directly from the diagram, . For the flat 3-dimensional generalization of Euclidean geometry, called 3-dimensional Euclidean space, we can choose as coordinates the distances from 3 fixed flat planes, each at right-angles to the other two. These are also called Cartesian coordinates. The distance between two points whose coordinates differ by , for and , is then , which follows from applying Pythagoras first to the and coordinates, and then to and . The symbol is the upper-case Greek letter Sigma, and indicates a sum of what follows it. The idea is that each contribution to the sum is obtained from the expression that follows the , by substituting a specific value for one of the indexes in the expression, and the notations below and above the show which index is to be substituted, and the range of values of that index, for which terms are to be included in the sum. Thus the meaning of is quite similar to the meaning of as above. The difference is that is used for a sum over a discrete index such as or , while , together with a tiny factor such as , is used for a sum over a continuous index such as . Let's now consider a small change to the positions and motions of the objects during the period of time from to . I'll represent the change, or ``perturbation'', of the positions and motions by the Greek letter , pronounced epsilon, which is often used to represent a small quantity, so the modified positions and motions are represented by . Here , like , represents an entire collection of data, for example it could introduce different types of wobbles to the motions of each of the objects. I shall assume that is 0 at and , or in other words, that for all values of and all values of , while for times between and , I shall assume only that all the are small, and change smoothly with time. Near the start of the post, above, I said that de Maupertuis's requirement, which implies Newton's laws, is that the action should be relatively unaltered by small changes to the positions and motions of the objects. What I meant by that is that as tends to 0, or in other words, as approaches 0 for all relevant values of , , and , the change to the action should tend to 0 more rapidly than in proportion to . since , and the contribution from the first expression, usually called a term, in the right-hand side of this, cancels against the last expression in the left-hand side of the above equation for each value of the indexes and , while the third term, proportional to , is much smaller than the second term for very small , so can be neglected. The symbol means ``approximately equal to''. The second line here follows from noting that if is any expression that varies smoothly with , then since , we have . The third line follows because the last contribution in the second line cancels part of the contribution before it, and the ratio is 0 in the limit where tends to 0. This is called Leibniz's rule for the rate of change of a product. From now on, if an expression represents a collection of data that gives the value of a quantity at each moment in time, I shall for brevity just say that is a time-dependent quantity. Let's now consider the expression , where is any time-dependent quantity whose value changes smoothly with time. From the description I gave near the start of the post above, this expression is given by dividing the period from to up into a great number of tiny time intervals, each so small that only changes by a tiny amount during any one time interval, and adding together a contribution from each of these tiny time intervals. The contribution from a tiny time interval of length is , where is evaluated at an arbitrary moment during that interval, and the expression is the limit of the sum of all the contributions, as the period is divided up so finely that the length of the longest tiny interval tends to 0. In words, this means that the integral of the rate of change of a quantity is equal to the net change of that quantity. where is the distance between object and object , and is Newton's constant of gravitation. If a quantity, such as the potential energy, depends on a number of quantities that can vary continuously, where represents the collection of those quantities, and the index distinguishes the quantities in the collection, and if the collection of data that gives the value of the dependent quantity at each , or in other words, at each set of values of the quantities , is represented by a symbol , then the collection of data that gives the rate of change of the dependent quantity as the quantity changes, while all the other quantities in have fixed values, is usually represented as , or alternatively as . The symbol is an alternative notation for Leibniz's , and , where the quantities in the collection other than all have the same values in both terms in the numerator in the right-hand side as they have in the left-hand side, so their values don't need to be displayed. where as the magnitudes of all the tend to 0, the error of this approximate representation tends to 0 more rapidly than in proportion to those magnitudes. For the two sides of the above formula are equal when . And by using the above definition of for the case when is , we find that , where is the Greek letter delta, and , which is called the Kronecker delta after Leopold Kronecker, is 1 when , and 0 otherwise. Thus applying to the right-hand side of the above formula gives for all , which is in agreement with the application of to the left-hand side when . Thus the two sides of the above formula would be in agreement for all if the quantities were independent of . This is not so in general, but the assumption that changes smoothly with implies that the differences tend to 0 at least as fast as the differences as approaches , so the error of the above formula tends to 0 at least as fast as products of two of those differences, and thus more rapidly than in proportion to those differences. where the error of this formula tends to 0 more rapidly than in proportion to , as tends to 0 for all relevant values of and . where the error of this formula tends to 0 more rapidly than in proportion to , as tends to 0.
for all relevant values of , , and . We are using Cartesian coordinates, so is the 'th component of the velocity of the 'th object, and , which is usually written as , is the 'th component of the acceleration of the 'th object. And by the definition of potential energy, the 'th component of the force on the 'th object is . Thus the above equation is Newton's second law of motion. since only depends on time through the dependence on time of the coordinates of the objects. To illustrate the practical application of de Maupertuis's discovery, which is sometimes called the principle of stationary action, let's consider a planet in orbit around the Sun, neglecting the gravitational effects of the other planets, which are relatively small. The mass of the Sun is much greater than the mass of the planet, so to a good approximation, we can treat the Sun as fixed in position, and just consider the motion of the planet around the Sun. The gravitational force on the planet is always in the direction of the straight line from the planet to the Sun, so the planet stays in the 2-dimensional plane defined by the straight line from the planet's initial position to the Sun, and the direction of the planet's initial velocity, which I shall assume is not exactly along that line. 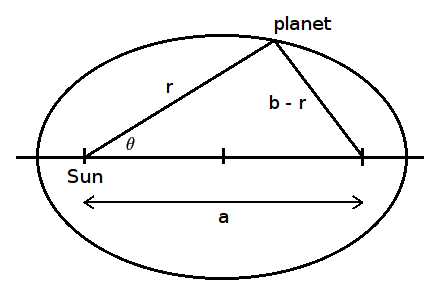 It is convenient to specify the planet's position in this plane by the distance from the planet to the Sun, and the angle between the straight line from the planet to the Sun, and the initial direction of that line. I shall represent that angle by , which is the Greek letter theta. To keep the formulae as simple as possible, the angle will be measured not in degrees but in "radians", where 1 radian is the angle turned through when something moving along a circular path has travelled a distance along the circle equal to the radius of the circle. Thus a full rotation is radians, and 1 radian is approximately . where the error of this formula is proportional to , and thus tends to 0 more rapidly than in proportion to , as tends to 0. To obtain this formula, we used the equality of the integral of the rate of change and the net change, as above, applied to the expression , together with Leibniz's rule for the rate of change of a product, as above, applied to the product of and . De Maupertuis's principle requires that the change to the action should tend to 0 more rapidly than in proportion to , as tends to 0. But from the above formula, this is only possible for all perturbations such that is 0 at and , and changes smoothly with time, if , for all relevant values of . This means that is independent of time. For a tiny amount of time , the area swept out by the straight line from the Sun to the planet during the time interval is approximately , which is the area of the right-angled triangle made by the straight lines from the Sun to the planet at the times and , together with the straight line tangential to the circle of radius centred at the Sun, that meets that circle at the position of the planet at time . The difference between , and the area swept out by the straight line from the Sun to the planet during the time interval , tends to 0 in proportion to as tends to 0, and thus more rapidly than in proportion to , so the rate at which the straight line from the Sun to the planet sweeps out area is . We found above from de Maupertuis's principle that this is independent of time, so the straight line from the Sun to the planet sweeps out equal areas in equal times. This is the second of the three laws of planetary motion, which Johannes Kepler discovered by studying the astronomical measurements made by Tycho Brahe. The product , which is also independent of time since the planet's mass is constant, is called the orbital angular momentum of the planet. I shall represent it by . The value of , like the value of the planet's total energy, partly characterizes the orbit of the planet. To use this formula to find the possible orbits of the planet, it is helpful to know about the Cartesian coordinates of something moving around a circle, and their rate of change with angle. If something is moving along a circular path, and is the angle in radians, as above, between the straight line from the centre of the moving object to the centre of the circle, and a fixed straight line in the plane of the circle though the centre of the circle, then the traditional names for the Cartesian coordinates of the centre of the moving object, relative to the centre of the circle, in units of the radius of the circle, are for the coordinate parallel to the fixed straight line, and for the coordinate perpendicular to the fixed straight line in the plane of the circle. The directions of the coordinates are chosen so that and . 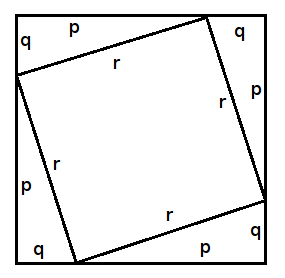 From Pythagoras, we have , for all . If the object starts at angle and goes round the circle times, so that increases by , where is any whole number, then the Cartesian coordinates of the centre of the object come back to their initial values, so that , and , for all whole numbers . This diagram shows , for in the range to . This exactly matches the formula for for the planet's orbit that we obtained above from de Maupertuis's principle, if and , so that , and , where denotes the absolute value of . The value of is negative because the planet is gravitationally bound to the Sun. is the length of the major axis of the ellipse, so this shows that the square of the orbital period is equal to the cube of the length of the major axis of the orbit, multiplied by a quantity that is the same for all the planets. This is Kepler's third law of planetary motion. The clue that led to the discovery of quantum mechanics, whose principles are summarized in Feynman's functional integral, came from the attempted application to electromagnetic radiation of discoveries about heat and temperature. In the next part of this post, Multiple Molecules, we'll look at some of those discoveries.